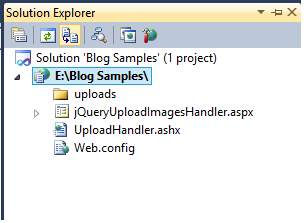 Here I will explain how to upload images or files using jQuery without page refresh or postback in asp.net using handler (ashx) in c#, vb.net or jQuery upload files or images without postback in asp.net using Handler in c#, vb.net or asynchronous file upload using jQuery without submitting form in asp.net with c#, vb.net. Now run your application that will allow you to upload files in upload folder using handler files. Thanks for the nice writeup. What is the largest file size can this approach support? Hi Suresh , it is woking fine in chrome but not in IE . what to do . Hi Suresh , it is not working in content page, what should i do? Thanks for posting this and making source code available. Hi, what is var test = new FormData(); i've error in FormData(), not find this function. Can you please publish the download code also using json.